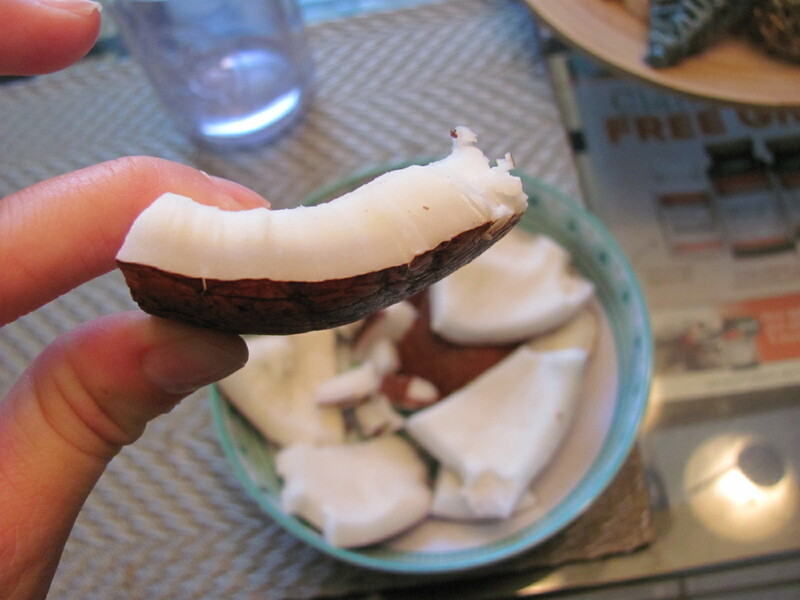 On a whim yesterday at the natural farmer’s market I decided to buy a coconut. Did I have a clue what I was going to do with it? Nope. Just wanted to buy it and play with it. Today, I was ready to take it on. I looked on Google to find out how to open it up and I wanted to share my experience with you! 1) Grab a large, clean nail or other sturdy pokey-type thing. I used a food thermometer, and it worked just fine. It will probably be best to use a large, clean nail though so you can tap on it with a hammer. Position the nail over one of the three eyes and press hard. If it doesn’t go through, ask someone to hold the coconut while you gently tap the nail through. Once it goes through, repeat on at least one of the other eyes and drain the milk. You can save the water and drink it or discard it like I did because I didn’t like the taste. 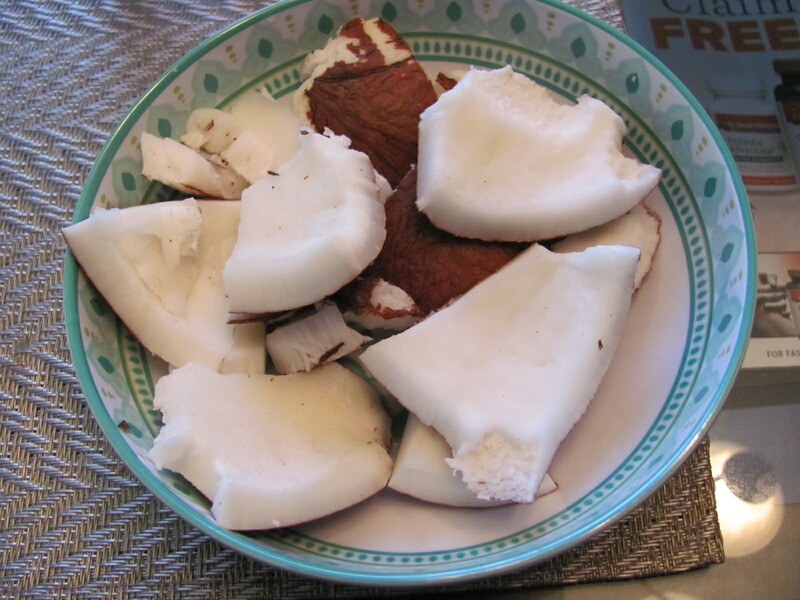 The coconut water you buy in the store typically comes from young, green coconuts (it’s sweeter). 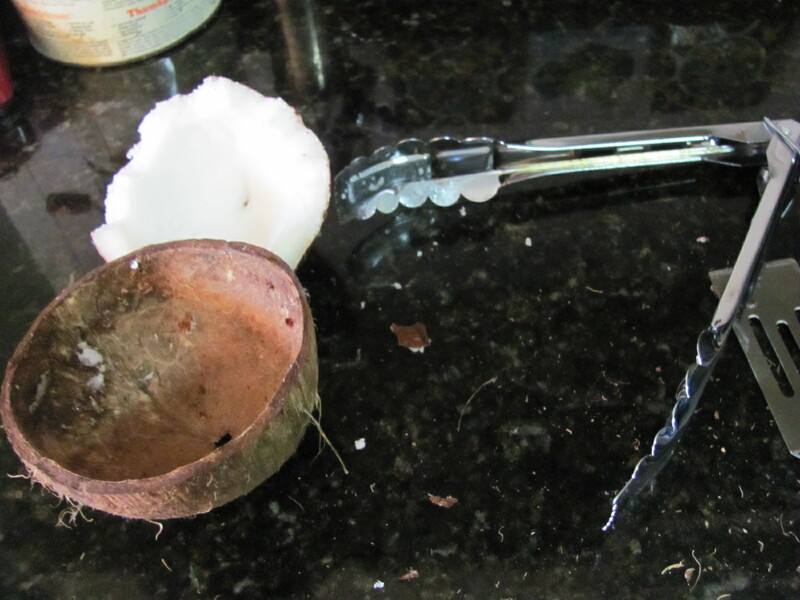 2) Get a hammer and tap around the very center of the coconut and rotate around. It needs to be a pretty firm hit, not whacking the hell out of it, but firm enough it makes a good bit of noise. 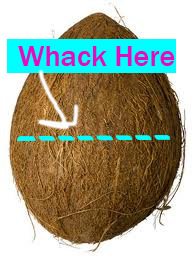 Keep rotating the coconut and thwacking until you start to see it split. Hit until it splits open enough to tear it open the rest of the way with your hands. 3) Get the meat out. How? How do I do that! It’s all stuck in there! Preheat the oven to 400°, put the coconut on a cookie sheet and keep it in the oven until the meat starts to peel away from the hard shell. Scrape out with a sturdy spoon or ice cream scoop, or a combination of other sturdy, curved things you have in your house. I used metal tongs that are curved and a teeny little spatula. I used the little spatula to get it started around the edges, and the tongs to go down on the sides. You have to wiggle it and push pretty hard, but you should manage to get it out in a large, almost whole piece. 4) Eat it by itself, shred it and use it for culinary uses. YAY! You cracked your first coconut!